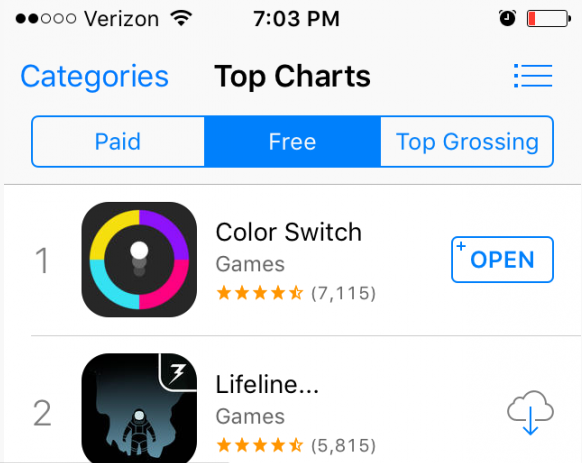 Color Switch just reached the #1 position in the US App Store. The hit action arcade game was created by David Reichelt in only one week solely using Buildbox. Color Switch is currently ranked number one in over 100 different countries including United Kingdom, Canada, Australia, and Sweden. The game is published by Fortafy Games and the concept was created by David in only 30 minutes. Currently, there is also another Buildbox game breaking the top charts. The Pit, which is published by Ketchapp, is currently in the Top 50 All Apps in the United States. Prior to Color Switch the most successful game made with Buildbox to-date was Sky, which was created by our lead developer Nik Rudenko and also published by Ketchapp. Sky reached the #7 spot in the US charts. During the last year we’ve seen Apple feature 25 different Buildbox games and 31 games breaking the Top 100. This is more than all other game building software platforms combined. Color Switch is a challenging reflex game that Gamezebo recently coined as the ‘Next Flappy Fix.’ In Color Switch players have to tap a bouncing ball through different obstacles. As the ball color changes it must match the obstacle’s color pattern in order to pass through. With each color switch there’s also a different power-up to use. The game features unique physics with a fast fun pace to make it a challenge and equally addicting. Congratulations to David Reichelt, Fortafy and the team behind this phenomenal success. Update: It has come to our attention the publisher of Color Switch has recently teamed up with the popular development house Eyebox Games. Together they have submitted an update to Color Switch that is ported from Buildbox to native code so they could add custom features. This new version plays identical to the original in gameplay and we’re excited to announce that every custom feature they added will be available in Buildbox 2.0. Buildbox 2.0 will be officially released in Q1 2016 and can be tested now through our early access program. Geek Squad Protection is an insurance plan offered by Geek Squad experts for customer ease. Under this plan you need not to pay labor cost or instruments retrieved while fixing the damage. Contact us for Geek squad protection plan renewal. Way to go David! You inspire all of us to take Buildbox 2.0 and create new and awesome games that have never been seen before. It makes me soooo happy when I see a normal guy that used his creativity to break out and break through. I only hope that I can do it too and now I know that it really is possible! Color Switch is to much fun which is what its all about. Thanks man you’re a true inspiration! USA! USA! USA! Thank you also for your service. Thanks Stephen! You are can do it too! Two books that were essential to make color switch are “Thinkertoys” and “The Art of Game Design.” I highly recommend you get those! David, can you tell me what software you used to create the animations for your game? For example inkscape etc. Great job David! Your much deserved success is inspiring to veterans and non veterans alike. Way to dominate! !